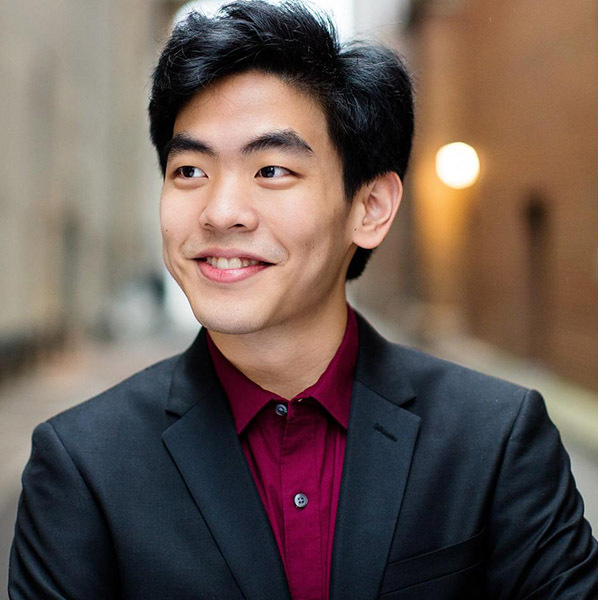 San Francisco native Daniel Hsu delivered a powerful, thoughtful, and sensitive program of piano works connected by strong imagery and an enigmatic French-Russian dimension, as part of the first-rate concerts sponsored by the Foundation for Chinese Performing Arts. This deeply inquisitive artist’s inner probing brought fresh meaning to great warhorses, reaching well beyond his stunning mastery of technical difficulties. On Saturday night at Jordan Hall, Hsu warmed up with the Bach Prelude and Fugue in C-sharp Major, BWV 848. Playing without damper pedal and employing a light touch, he emphasized the melody, giving the prelude a reflective, pensive reading. The fugue emerged with the distinctive liveliness of a newly-formed idea, receiving thoughtful pedal colorations in the episodes. Hsu basically turned the piece into a subtle tableau of how thought arises from reflection with a sort of soaring integrity, uncontaminated by emotion or sentimentality. Rachmaninoff’s Etude-Tableaux, Op. 39, No. 5, presents challenges on every level — technical, musical, and emotional. It is the largest of the composer’s second set of “picture studies,” harmonically elaborate, at times hinting at the Dies Irae, depicting no specific image (“form your own picture,” Rachmaninoff wrote), but displaying complex and turbulent emotions throughout. Hsu’s delivery of this complexity took our breath away. His exceptional control maintained clarity and transparency even in the deep registers, allowing the long melodic lines to sound out clearly. He managed to imbue isolated upper notes with a hint of hesitancy, which gave the cathartic momentum all the more expressive power, as of lava breaking through a thin surface. Tchaikovsky’s virtuosic one-movement Dumka, Op. 59 in C Minor, “Scène Rustique Russe,” is one of the composer’s most successful piano works. Dedicated to the French pianist and composer Antoine Marmontel, it brilliantly conveys the form’s characteristic manic-depressive shifts from melancholy to wild exuberance. Hsu magically evoked images of the soul in a Russian village (mir or shtetl), bringing out the perennial misery, hope and manic outbreaks of local folk themes. He opened with a deep melancholy, vast as the flat steppes, a beautiful rich and earthy tone tinged with spiritual yearning. Carefully shaping the upper register triplets so as to produce a shiver down the spine, Hsu navigated us into the increasing joy of the first manic episode, building to the frenetic extroversion and sense of collective connectedness that come from rhythm and dance (Russian peasant sobornost, so dear to Dostoevsky). Wild arpeggios and rapid, powerful double octaves culminated in a manic joviality before receding back down to an even deeper melancholy where human life sinks into back-breaking daily labor, endless as the Russian horizon. Chopin’s Piano Sonata No. 2 in B-flat Minor, Op. 35 took many years to reach its current status. Schumann, who had earlier praised Chopin (“Hats off, gentlemen, a genius”), said that calling this work a sonata was a joke: “for he has simply bound together four of his most unruly children.” Other than the Marche funèbre third movement, the sonata rarely figured in 19th century concerts. Only some 70 years later did the world catch on to what Chopin had accomplished. Hsu made the sonata his own, in an interpretation unlike anyone else’s, yet entirely convincing, boldly imbued with deep existential meaning right from the opening Grave, here conveyed not as heralding our mortality but as confronting the soul with the massive threat and seductiveness of fleshly gratification. The doppio movimento then emerged as a racing, fiery and frantic attempt to escape from the seductive ambush. Hsu took the second theme, piano and sustenuto as indicated, evoking a spiritual self-possession of repose and delight; the closing theme then embraced the flight itself as a source of jouissance. The scherzo continued the atmosphere of struggle between flesh and soul, played rapidly but with an effervescent touch, bringing out the mazurka dance-like aspect of the scherzo theme, against which the trio section seemed to protest with a wistful and waltz-like voice, only to face anew the return of the ominous mazurka, mocking, devouring and threatening. Hsu opened the funeral march at p rather than pp and carried the sustained crescendo nicely to the sudden outburst of ff, his control of the dynamics bringing out the tragic emotions. In the trio he emphasized the right hand cantabile, the slow, very light left-hand arpeggios sounded like a harp accompaniment. The effect was one of soaring, idyllic beauty, as though affirming that “we are spirits in a physical world.” In the inexorable return of the marche we felt the weight of the flesh as a motion toward inevitable decay and annihilation. Hsu’s rendering of the mysterious finale — soft and rapid, brief pedal coordinated with the phrasing almost as a flutter pedal — produced the eerie feeling of returning dust to dust. The second half opened with Liszt’s Transcendental Etude No. 8 in C Minor, “Wilde Jagd”. The Wild Hunt was a widespread folkloric theme, ranging from Brittany to Slovenia, depicting a spectral hunting group and portending death, war, or personal destruction. Hsu’s percussive and exciting opening preceded a light-hearted and joyful main theme, but grew more heated and wild, with a threatening undercurrent. Crouched over the keyboard, Hsu implied that the composer must wrestle with the terrifying demons of his own genius, risking destruction in the effort, never to come through it unscathed. After the demonic recapitulation, the coda filled with violent forces, the cadence becoming definitive, unavoidable. Mussorgsky’s famous suite was originally known as Pictures from an Exhibition, “A Remembrance of Viktor Hartmann.” A year after the painter’s sudden death came a memorial exhibition of hundreds of his works and the composer’s subsequent set of musical pictures or denkmals, occasions for reflection. Though he wrote the solo piano score in 1874, publication did not come until 1886, five years after Mussorgsky’s death, with “corrections” by Rimsky-Korsakov, who failed to understand some of the modernist elements. Dozens have since orchestrated it, Ravel’s being only the most well-known. In Hsu’s thoughtful reading in this commemorative spirit, the Promenade appearances ranged from a bold setting out with great expectations, to a reflective and dreamy mood, to a beautifully executed light and delicate tremolo in the con mortuis in lingua mortua. He skillfully gave each picture its own style: sudden erratic twists and jumps with rapid mood changes in the Gnomus, elegiac nobility in the Il vecchio castello, smooth and voluptuous. Bydlo started properly ff, crushing, heavy and blind. Hsu took full advantage of the Ballet of the Unhatched Chicks to evoke a strange and alien fluttering realm. In the powerful dark chords of the Catacombae, he evoked a realm in which time has vanished. His emphasis of the powerful, sharp chords of Baba Yaga made the riddle of death ferocious and terrifying, yet led straight into a grand and noble climax with the depiction of Hartmann’s Gates of Kiev as only a design. The resultant musical apotheosis, the concluding coda a marcato, celebrated art over death. A single brief encore, Schumann’s Traumerei, played with marvelous tenderness, left us in a suitably dreamy state after a massive, magnificent, and memorable performance.